Has your conductor punched it yet? I’ve heard a lot of Christians say that since they have accepted Jesus as their Savior and been baptized, they are assured a place in Heaven. Is that true? Can you take that one step and get a golden ticket to heaven? No matter what you do later, no matter how much heartbreak or whatever laws you break? Is that ticket to heaven still good? Was it punched when you were baptized or were you simply issued a ticket that still needs to be collected, scrutinized by the conductor and punched before the train leaves the station? Who stays on that railroad to heaven and who is put off? A common question is this: “What about Hitler?” He was a baptized Christian. Is he in heaven now? What about the priests that have admitted or been caught molesting children in their charge? What about the ministers that even today are being accused of adultery with the wives of their congregation or even with a brother’s wife? What about those in prison for murder that were baptized as children, or those that were highly regarded church-going citizens of the community before they did some heinous crime. How about the murderer who was baptized a few days before his execution and appeared to be sincere about accepting Jesus? What about those within the church that simply show up at Christmas and otherwise do nothing for Christ the rest of the year? What about those who show up every Sunday and tithe and even teach Sunday School but then gossip to their neighbors about someone they know? Do you know where the line is drawn between a punched paid-for ticket and a tattered wortless one that will be consumed along with its holder? Most of us would say that Hitler, probably anyone that murders or molests children would certainly be put off the train and left behind. Others will still cry out, even shout, that the only requirement is to accept Christ and be baptized. Once in, forever in! So what do you think? Here are some thoughts to consider before you make up your mind. It may be a hard lesson. You do receive a ticket good for boarding the train when you are baptized in the name of the Lord, but whether it is accepted depends on your heart and life – whether you are walking in the footsteps of Christ or not. It is not prepaid and it is not punched for the final destination. Why do I say that? Read on before you reject it. There is a prepaid, punched ticket: It is issued by the Holy Spirit by a separate baptism. There is the baptism by water which you can receive in church or in a nearby stream. It is a formal baptism, but it may not be enough. There is a second baptism that comes only through receipt of the Holy Spirit. For example, see Acts 8:12-24 in which Philip had already baptized a number of Samaritans into the name of the Lord, meaning they had declared an acceptance of Christ and been dunked in the water. They had their ticket, however they had not received the Holy Spirit. When Peter and John prayed that they would receive the Holy Spirit, they were so filled. At that moment their ticket was punched. Clearly, if Philip had issued the ticket to Simon by baptism with water and he had accepted the Lord, most of us would say he had a good and lasting ticket to Heaven. But Peter said he would perish anyway. Peter and John recognized by his actions, that he had not been baptized by the Holy Spirit. The lesson here is that baptism by water and declaration of acceptance of Jesus is not enough to assure safe passage! There is a place in the heart, a place in the soul that needs special attention. Simon’s ticket needed further validation, one by the infilling given only by the Holy Spirit. Can you be baptized by the Holy Spirit without baptism by water? Well, yes. Again, I think most of us would have said no! But in hearing the message, the Good News, many become believers and receive the Holy Spirit at that moment. Baptism by water may come later. Read Acts 10:44-48. The gentiles at Caesarea heard Peter’s message and were filled with the Holy Spirit and soon after were baptized in water by Peter. Is the infilling of the Holy Spirit the same as baptism by the Holy Spirit? Yes. Prior to Jesus first coming however, the Holy Spirit was vested only on certain special people, and, in fact, was sometimes removed. But Jesus told his disciples that he would ask the Father to send the Holy Spirit to baptise them. See John 14:26, then see Acts 1:4-5. What did Jesus Say about the need for the baptism by the Holy Spirit? The Holy Spirit was involved in the virgin birth of Jesus. See Luke 1:35. The Holy Spirit baptized Jesus after John baptized him with water. See Luke 3:21-22. Jesus told Nicodemus that he must be born again with the Holy Spirit. John 3:5-6. Jesus answered, “Very truly I tell you, no one can enter the kingdom of God without being born of water and the Spirit. Flesh gives birth to flesh, but the Spirit gives birth to spirit. There you go! Baptism by both the water and the Spirit. From the lips of Jesus. Your ticket is issued upon receiving your baptism by water. But it is worthless if you do not receive Baptism by the Holy Spirit, an infilling that lasts a lifetime. Those that are baptized with water in the name of Jesus that later turn to crime or do not follow and actually serve God are subject to the judgement that may result in confiscation of their ticket and a toss off the train into the lake of fire. Their hearts were never right, their souls were never filled with the right ingredient. The Holy Spirit had not validated their ticket. The Holy Spirit baptism lasts a lifetime and is not given lightly and cannot be abused. It is my guess that someone that has claimed to have been “born again” or appeared to have received the Holy Spirit and later committed some crime was somehow fooling us and even themselves. I don’t believe the Holy Spirit makes those kinds of mistakes. How do you know you have received this infilling of the Holy Spirit? You probably will not know until you meet the conductor and receive His judgement. There is a certain peace that prevails and many people obviously have received it. However, although I think I’ve received it, and I’ve even spoken in tongues (only once), I cannot say for sure – did I just will it on myself? Fooling myself? I am not my own judge. I’m afraid I don’t measure up. I know I do the wrong things, say hurtful things, make judgements, do selfish things and things to make people notice me. I know I don’t pray enough, don’t read the bible enough and sometimes make up excuses to not go to church when I should. I gossip and tell white lies, and do things I’m not proud of. So I don’t know whether I’ll be “up there” with you or not. Pray for me. Whatever the verdict, I accept it. Only God holds the keys to the kingdom. He is Sovern. It is His call, not mine. I’m doing the best I can and if that is not good enough, I deserve to burn with the worst of them. Thank God for God’s gift of Grace and for His Son, sent to teach us His ways and to give us the gift of salvation through his death and through the Holy Spirit. Are you doing the best you can? What have you done for God lately? 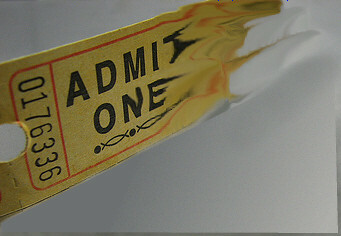 What is the condition of your ticket? Will Jesus open the book, look at you, check your ticket and declare “I don’t know you!”, or will your life since baptism prove good enough? Let’s pray it is the latter. If you are afraid you don’t measure up, please don’t panic. Go to your church and ask for guidence on how to get on the path God wants you to be on.